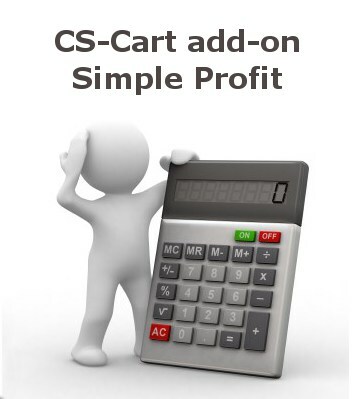 CS-Cart "Simple Profit" add-on gives you the ability to see profit calculation for every product or order in reports. Each Product has a cost price. Total Profit per each Order is displayed on order details page. 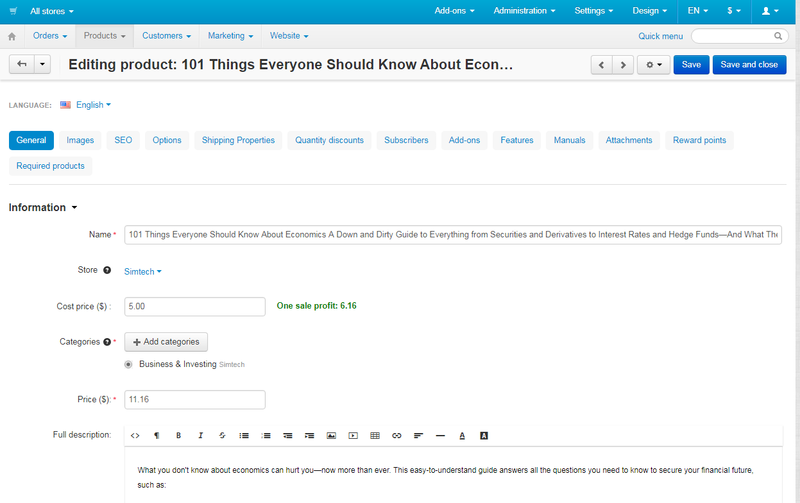 Total Profit per all orders is shown on the View Orders page in the admin panel. When the cost of the product changes the previous sales will not change. They will stay the same according to how much the cost price was when it was sold. There is an ability to run the script that generates all profit data before this addon was installed. You just need to add cost prices to all products in your store. This script should be run only once after the add-on installation. Cost price for products can be added via CVS import in a second. We added the ability for the super admin to hide profit information from the employees and other administrators of the store. This add-on works correctly in Internet Explorer, Mozilla Firefox, Safari, Google, Chrome and Opera latest browser versions. Notes: After the payment is confirmed, you will be able to download the add-on from the order details page. Please, contact us if any questions arise. There is an ability to calculate the margin per each product after the cost prices are uploaded for all products. 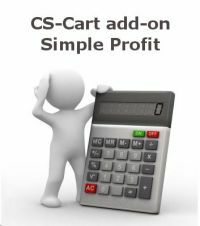 How to add cost price to every product in a bulk. In the admin panel go to Administration ->Import data-> Products tab. Import data, adding Cost Price field. 3. 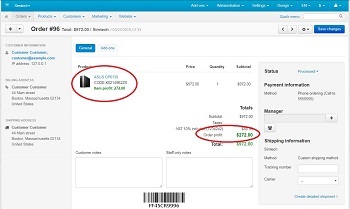 Automatically, after the import, the one sale profit will be shown on every product page. 4. Go to "Simple Profit" add-on's settings (Add-ons->Manage Add-ons ->Alt-team: Simple Profit) and run the script by clicking to "Generate" link. 5. 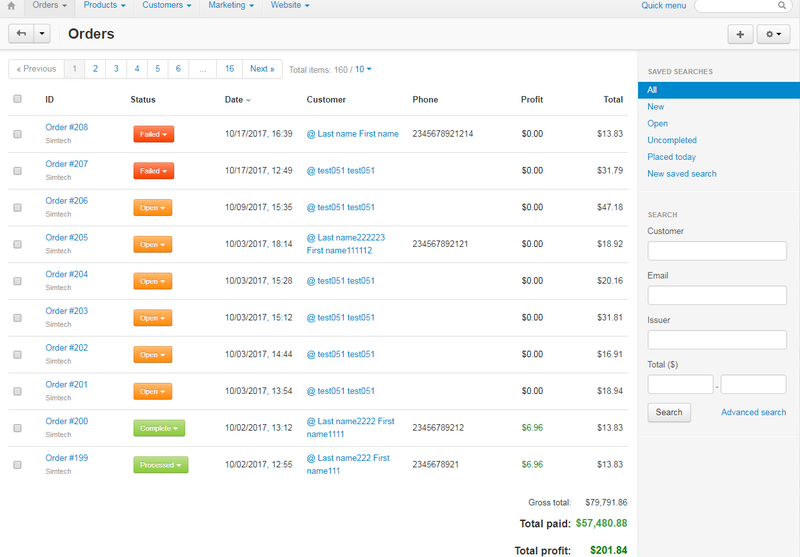 Now, it will be easy to monitor the profitability of each order. 1. Download the archive with the Simple Profit add-on. 3. Log into the administration panel of your store, go to the Add-ons -> Manage add-ons. 4. In the list of add-ons find the Simple Profit add-on and click Install opposite to its name. 7. Read the Documentation to learn about the add-on settings.